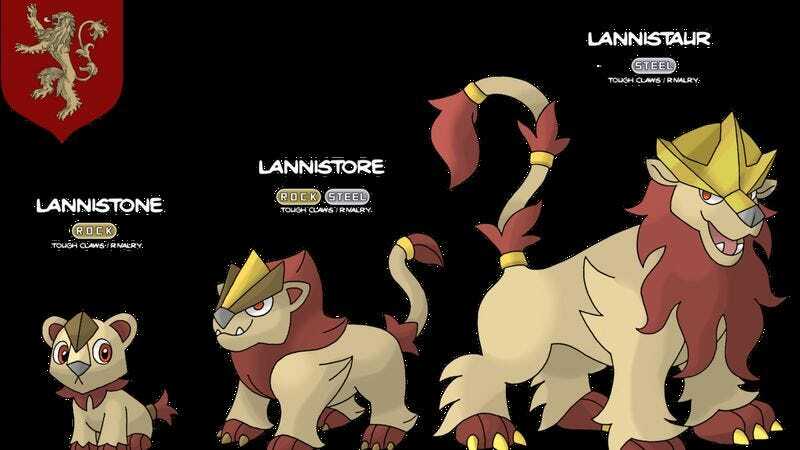 Redditor SketchyCartoonist isn’t the first person to combine Game Of Thrones and Pokémon. In fact, if you Google the two phrases together, you get an almost overwhelming amount of stuff, from the Game Of Thrones characters as Pokémon trainers to a Pokémonized version of the Thrones opening sequence. SketchyCartoonist opted to show the combined fandom by turning Game Of Thrones house sigils into Pokémon, and it actually works really well. It manages to make the Flayed Man of House Bolton not terrifying, and almost turn House Frey’s two stone towers into a character capable of movement.